In a small skillet over medium heat, heat oil and then add shallots (or onion) and garlic, saute for 4 – 5 minutes. Remove to a large bowl. Stir in spinach, spices, and feta, then mix in egg and sour cream. On a large, clean, dry work surface, lay out a sheet of phyllo. The rest of the sheets should be covered with plastic wrap with a damp towel on top while you work. Working from the center to the edges, brush melted butter along the lower half of the sheet. Fold sheet over so that you have a long rectangle. Mound a couple of tablespoons of filling into the upper left corner into a triangle shape. Paint the rest of the sheet with butter, then fold up the triangle (like a flag fold, only tastier) until it reaches the other side as a nice triangular packet. Paint seam with butter and place seam-side down on a parchment-lined baking sheet. Repeat. 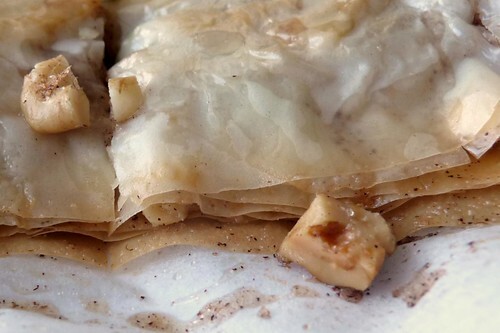 Alternative: Fold the full sheet of phyllo (after painting half) along the shorter edge so that it forms a square. Turn it so that it looks like a diamond with a tip pointing towards you. Pile a bunch of filling in the center in a log shape, ending an inch or two (depending on the size of your square) from the right and left points. Paint edges with butter, then tuck the sides in and roll from the bottom, a la an egg roll. This method results in much bigger portions than the triangles. Bake for 15 minutes or until golden brown. Serve with tzatziki or some garlic sauce. Making spanokopita isn’t as difficult as I thought it might be but it is essential you have your components all ready to go. It goes quite quickly, all considered. I was planning to make BakingBites’ Easy Vanilla Gelato to serve with this but a couple of good sales left my freezer too packed to accommodate the ice cream maker’s base. I’ll have to save that for another day. Combine sugar and cinnamon. 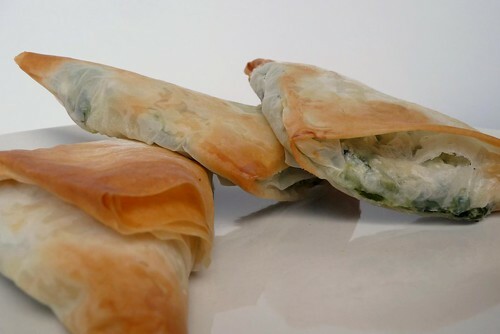 Line a sheet pan with parchment and lay a sheet of phyllo on top. Brush with butter and sprinkle a third of the walnuts over it. 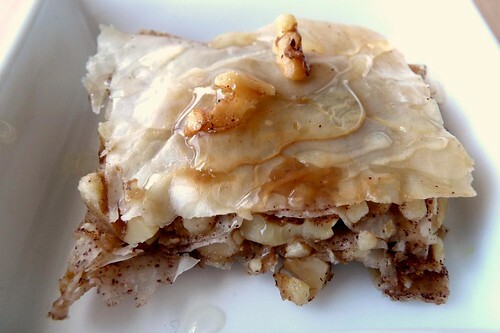 Sprinkle a third of the cinnamon-sugar over the walnuts, then top with another sheet of phyllo. Repeat twice more and finish with the fourth and final sheet of phyllo. Cut into 2″ – 3″ squares with a sharp knife. Cover with another sheet of parchment and rest a second sheet pan on top. Bake for 18 to 23 minutes or until golden. Remove and serve warm with ice cream and honey. Since I had only a quarter-sheet pan and a half-sheet pan available at the time, I cut the phyllo so it would fit in a quarter-sheet (and also because a half-sheet of baklava squares for two would be a little much!). If you make a half-sheet, double all of the ingredients’ measures. 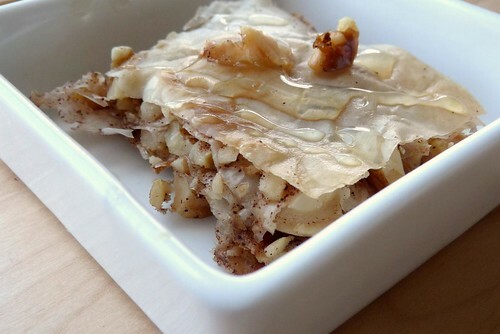 This entry was posted in Dessert, greek, recipes, side, untranslated, vegetarian. Bookmark the permalink.